Just’a Spray Ostomy deodorizer 55 mL effectively neutralizes odours inside ostomy pouches. 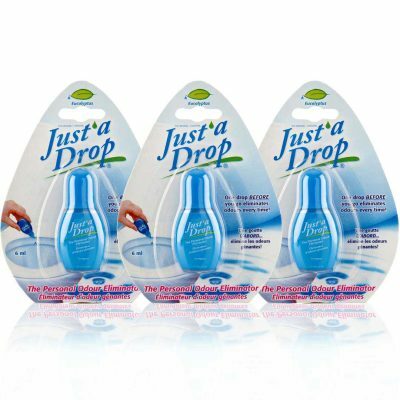 Just’a Spray Ostomy deodorizer 55 mL is the new & better way to neutralize odours inside ostomy pouches. Great for home & ideal for use in your ostomy pouch & standard toilets. Simply spray into your pouch to help eliminate ostomy odour as needed or into the toilet bowl before emptying the ostomy pouch. After a decade of fighting toilet odours with our popular Just’a Drop toilet drops, our team of experts decided to use their knowledge to develop an odour neutralizer which would help ostomy patients improve their everyday life. Just’a Spray for ostomy is a remarkable breakthrough product for ostomates as it works to eliminate odours in the toilet bowl and is safe to use in your ostomy pouch. How to Use Just’a Spray Ostomy Deodorizer? Stop odours before they start. Ostomy spray Just’a Spray is as easy as the name suggests! Simply spray as needed this safe, concentrated formula directly inside the ostomy pouch to help eliminate odour when the pouch is emptied. you can also use Just’a Spray in standard toilets! All you have to do is spray into the bowl as needed, before emptying the ostomy pouch. Just’a Spray will form a protective film on the water surface that traps & eliminates ostomy odours before they escape into the air.